The Queen to Me A Royal Pain Doth Give (From Two Madrigals from the Triumphs of Thusnelda). 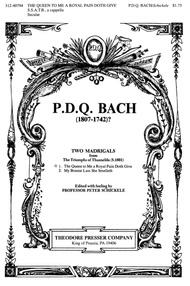 Composed by PDQ Bach (1935-). Edited by Peter Schickele. Mixed chorus. For Soprano I, Soprano II, Alto, Tenor, Bass, Piano Rehearsal. Two Madrigals From the Triumphs of Thusnelda. Choral. Piano reduction/vocal score. Standard notation. S 1601. 11 pages. Published by Theodore Presser Company (PR.312407940).With Standard notation. choral.